The Best Monitoring Product in April! SpyAgent sets the bar with its award-winning, computer monitoring that creates the ultimate all-in-one spy software. SpyAgent logs everything users do including all keystrokes, emails, applications, windows, websites, internet connections, passwords, chat conversations, and even screenshots. SpyAgent can run in total stealth, defeats popular spyware detectors, and provides website, chat, and application blocking abilities. Our 2019 Top Selling Remote Monitoring Solution! 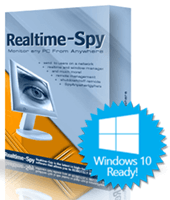 Realtime-Spy is the latest in cutting-edge remote monitoring software that allows you to monitor ANY PC you own from ANYWHERE. Realtime-Spy is remotely installable (no physical installation needed), and its activity logs are accessible from anywhere - regardless if the remote PC is online or not. Realtime-Spy logs all keystrokes, websites visited, applications ran, e-mail activity, chat conversations, screenshots, and more - in complete stealth. Realtime-Spy can also show you what users are doing, and typing, in real-time. Our Top Selling Employee Network Monitoring Software! NetVizor is the latest in centralized network monitoring software that can invisibly monitor your entire network from one centralized location! 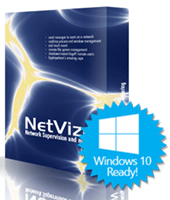 NetVizor allows you to track workstations and individual users that may use multiple PC's on a network, and can be rolled out from one location via its remote installer. NetVizor records everything users do, including screenshots, keystrokes typed, application and website usage, email and chat activity, file and document usage, and much more. Detailed activity reports can be generated to summarize and breakdown what is happening on your network. NetVizor can also show you what everyone is doing on your network in real-time with a single mouse click via its visual network overview and real-time activity ticker. Ideal for Monitoring Employees from a Centralized Location. Thank you for visiting 1SpySoftware. Confused about which monitoring product is the best solution for you? We want to help you, just send us an email and we will respond quickly with answers to any questions you have. Computer Spy Software is a software product that will monitor the PC activities of any user on your PC. SpyAgent, our top monitoring software product, can record chat, internet browsing habits, spy on emails and other related internet activity. 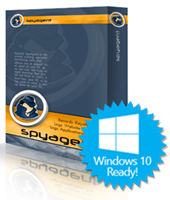 SpyAgent will run in complete stealth if you choose which completely hides itself from others using your PC. When SpyAgent is running, you won't see any icons in your system tray, CTRL + ALT + DELETE window, or anywhere else. SpyAgent is programmed to completely hide from even the most savvy computer users. Take a look at what SpyAgent features are offered. What is Remote Monitoring Software? Remote monitoring software allows you to spy on any computer you own from anywhere you have an internet connection. Once the software is installed, you will login to our website with the provided username and password we send you and then review the remote spy software logs. Do you have a computer upstairs, such as a child's computer, that needs to be monitored? Now you can spy on their computer quickly and easily using Realtime Spy remote spy software. Just install this top remote monitoring software once and you are set! Just login to our site and begin review their activities without your children knowing. Amazing! Employee monitoring software allows a business owner or large family to monitor their employees from one centralized location. Once the software is installed, a supervisor will be able to easily monitor all activities on the employee's PC including internet history, windows opened, opened software, and even monitor content such as keystrokes typed, chatroom conversations, and more. Do you have a company or household with five or more computers? Now you can easily monitor all of their PC usage from one centralized location. Take a look at our NetVizor employee monitoring software. Just install this centralized employee supervision software and begin monitoring their PC usage today!